David Gelly gets great reviews in our book! David Gelly has authored numerous essays and short stories on global travel, athletic accomplishments and life experiences. A raconteur and oenophile of note, he is an avid marathoner and cyclist who explores unusual places in his travels on domestic as well as international assignments. He is also quite a talented storyteller! He has plied his trade in government agencies as well as in the corporate ranks of many significant entities taking him through the streets and alleys of concrete canyons as well as the twists and turns of the Silk Road to the wheat fields of America’s heartland. A graduate of Northeastern University in Boston, he currently resides in North Carolina as well as the mountains of southwest Virginia, where his most recent book, Fancy Gap, is set. David has been very supportive of ma Cares and our “A Night of Stars – Saluting Our Veterans” event to benefit Patriot Rovers. He also uses his interest in cycling to help raise money for charities. Naturally, we wanted to learn more about our local talent and his involvement in the community and David kindly obliged. ma Cares: What inspired you to write your first book, Fancy Gap? David Gelly: Well Fancy Gap was born of the legendary fog on Fancy Gap Mountain. So many unfortunate horrific car crashes have happened in that fog that I soon realized that the fog could be the basis of a murder/mystery novel. Fancy Gap is the 1st in a series of five of the “Gap” series. The second installment will be “Orchard Gap” an agro-terrorism thriller. ma Cares: What challenges did you encounter in writing it? David Gelly: I am a story teller. I wrote the story in but three months. All 99,999 words came out in that time. Once I realized that the story worked, the next six months where spent working with my editor to get Fancy Gap in the proper style/format that this novel demanded. ma Cares: What suggestions would you give to aspiring writers? David Gelly: WOW…large question! I now encounter so many people who say, “Gee I’ve always wanted to write a book!” It is now possible thru self-publishing for anyone to realize their dream. The days of having to find an agent and a publishing house are history. I used CreateSpace. They were wonderful to work with. I hope to make the book available on SHOP.COM. ma Cares: As an avid marathoner, how often do you participate in marathons? ma Cares: What are some other ways that you give back to the community? David Gelly: My son Eric is the COO of the North Carolina Credit Union League. We have a wonderful group of credit union runners and bike riders who raise money for charity and special groups. We are: www.teamlittleguy.com Check us out! My favorite ride was where we raised over $161,000 for the Hope for the Warriors Care Center at Camp Lejeune. In a week we rode our bikes to all the military bases in North Carolina. It was a week I’ll never forget! We are certainly impressed with his many accomplishments! 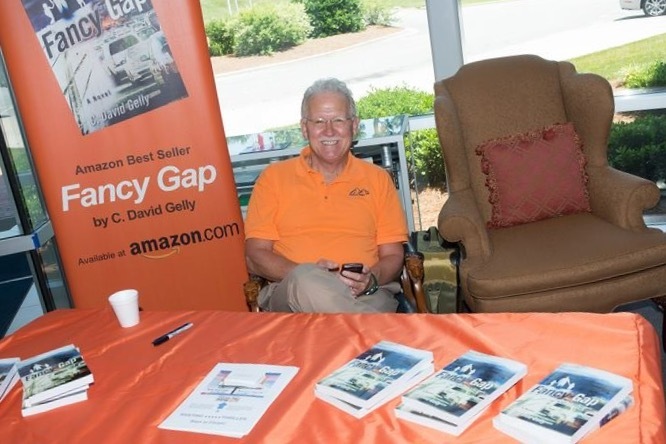 To learn more about David and how to purchase his book, check out the Fancy Gap Facebook page, connect with the author on Twitter or send him an email.